Whoever said "church is BORING" has never set foot in Oxygen! Oxygen Youth Church services are like nothing you've ever experienced. Cool room, loud music, lots of teenagers, and entertaining skits coupled with the Word of God guarantee you won't be bored. We exist for young people to come together with others who want real life answers, a place to hang out, and who desire to build authentic relationships. 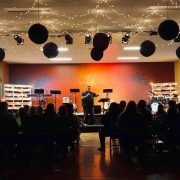 Oxygen is a youth ministry consisting of individuals in fifth grade thru twelfth grade who want to experience God for who He really is and develop a life-changing relationship with Jesus Christ. At Oxygen we strive to reach young people, connect them with others who share the same experiences, help them grow as individuals through discipleship, and provide an opportunity for every student to serve God in ministry.